At a special send-off held at Palais Wertheim, Christian Mutschlechner – the long-serving head of the Vienna Tourist Board’s Vienna Convention Bureau – expressed his gratitude to colleagues and partners from the city’s meetings industry. He will be succeeded by Christian Woronka, a member of the team that founded the Cologne Convention Bureau and its manager since 2012. Christian Mutschlechner has the meetings business running through his veins. He started his career in 1977 as a trainee at the Vienna Airport tourist office before moving to the Vienna Tourist Board in 1985. He was appointed head of the Vienna Convention Bureau (VCB) in 1990, taking office in 1991. In that year, he was instrumental in initiating the publication of annual performance indicators for the Austrian capital’s meetings industry – data that helped turn Vienna into a European pioneer. Director of Tourism Norbert Kettner at the farewell event on 1 February explained that over more than a quarter of a century, Christian Mutschlechner has had a major impact together with his team and Vienna’s meetings industry. He drove forward the establishment of an international network and worked tirelessly to make Vienna one of the world’s top destinations for congresses and meetings. The number of such events in the capital has more than tripled on his watch, with an induced economic impact that currently runs into more than EUR 1 billion a year. I would like to express my thanks to Christian Mutschlechner, his dedicated team and everyone involved in Vienna’s meetings industry, without whom such success would not have been possible. He also looks forward to working with the new head of the Vienna Convention Bureau, Christian Woronka, who will take over at the age of 38 – exactly the same age as his predecessor. The Vienna Tourist Board’s management team will be welcoming a meetings expert with a proven track record. He will build on the outstanding achievements of his forerunner, but at the same time bring added impetus to our efforts to attract corporate events. One of his focuses will be digital communication, Kettner added. 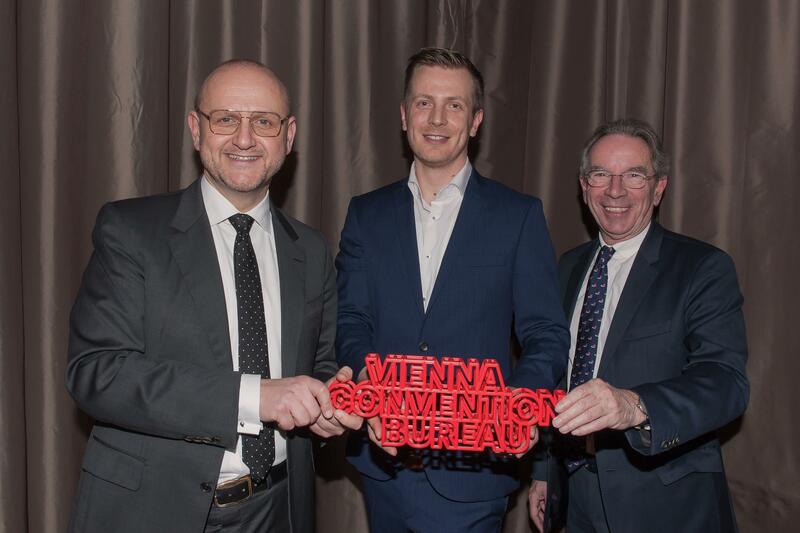 Enhancing the city in line with the meetings industry’s needs will play a significant part in the Visitor Economy Strategy 2025, which the Vienna Tourist Board is currently developing and is due to be unveiled this autumn. The strategy is being drawn up in collaboration with stakeholders from the meetings and leisure tourism industries, and in consultation with representatives of Vienna’s districts, the retail sector, property developers, action groups and universities. An international expert committee is providing insights into the broader picture. One of its members – Ben Goedegebuure, Global General Manager EMEA at Maritz Global Events – also attended the send-off and talked about prospective developments in Vienna’s meetings industry in his speech. In an interview with the outgoing VCB head, two long-time partners of Christian Mutschlechner in the international meetings sector – Patrick Delaney, Managing Partner at marketing agency SoolNua, and Michel Couturier, Managing Partner at Marketing Challenges International – looked back on some personal highlights from his career. The event was moderated by Daniela Zeller.